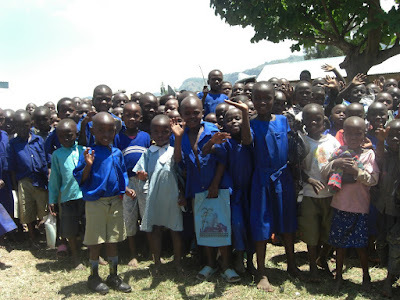 Earlier this year a party of teachers from Rhondda Cynon Taff visited our partner school in Mbale. They took with them some old football and rugby kit and other items. The photographs show how delighted the children were to be able to play in our kit. Headline news from our ESTYN inspection. We have received very positive and encouraging verbal feedback from the Registered Inspector following last week's ESTYN inspection. Their judgement is the Gelli Primary is a good school with no important shortcomings but has some outstanding features in many areas. Mr Alan Walters, the registered inspector reported back his preliminary findings to the staff and Governing body on Thursday evening. The full report will be produced within 45 days and will contain seven grades against the key questions in the inspection framework. The main findings were that they judged standards to be good overall with many outstanding features in many areas of teaching and learning. The inspectors saw sector leading practice in the areas of behaviour along with the care, guidance and support we offer the children. Leadership and Management were also judged as outstanding features, particularly the model of distributed leadership along with our use of available resources. I am delighted for the staff as they have worked constantly over the last three years with me to raise standards. They commented very favourably about the team ethos that the school has. I'm also very pleased for the community who now have official verification that we have a school that the village can be proud of. I also feel that with time we can continue to develop the areas and identify outstanding practice in other areas. The main stars of the week, however, were the children, who were singled out by the Inspectors as confident, polite, hard working and a credit to all of us. They commented that everyone succeeds at Gelli Primary in their own way. The full and short report of parents will be published before the summer holidays. I am sure that you will enjoy reading about our achievements. I am so pleased that this week has been such a success for you, all too often I hear of schools who crumble under the pressure of inspections. Although, you knew all along that you have a fantastic bunch of teachers in the school and that all was in perfect working order. I am also thrilled that you invited Idris and myself up to the school yesterday for assembly! Penblwydd hapus i Mr Jones. Yesterday Mr Jones in Year 5 celebrated his birthday. Penblwydd hapus i Mrs Fraser. We made a big fuss of Mrs Fraser this week as we celebrated her reaching the end of another decade. She can now look forward to life begining as the proverb says. Can I thank all those parents who attended the pre inspection meeting with the Registered Inspector last week. Although I was not present, I have been told that it was very positive and reflected the support we have from you as parents. I hope that we can show this to the inspectorate this week. The Eco Schools Council eco greenhouse has been completed in the garden. Thank you for providing us with hundreds of three litre plastic bottles to complete it. Please will you thank friends, family and work colleagues who have helped. The gardening club are busy cultivating plants to put out to decorate the school after the frosty weather clears. Our host ISP has reported that they are currently undertaking routine server maintanance over the coming three weeks. Some aspects of the school website will be unavailable for update during this time. The Latest news and class blogs will remain unaffected, so will the electronic calendar. Thank you for your patience. As you already know the school is due to be inspected as part of the programme of regular school inspections arranged by Her Majesty’s Chief Inspector for Education and Training in Wales. The inspection will be carried out by a team led by Mr. Alan Walters, a registered inspector. This letter is to formally invite you to attend a meeting with the registered inspector that is being held before the inspection on Tuesday May 4th at 5.30 p.m. in the School Hall. The meeting is open to all parents / carers of pupils at the school. The staff and governors will not be present during the meeting unless they also have children in school. The purpose of the meeting is for you to tell the registered inspector your views about the school and how it works so that so that these views can be included in the inspection. Although the registered inspector will want to hear your views, and will attempt to answer your questions, he or she will not be in a position to comment on your views, which will be taken account of in the inspection. The registered inspector will also be able to tell you about the inspection.